Last autumn we featured some adorably tiny Greek galleys, and I noted how unusual Classical LEGO creations are, despite several Greek and Roman soldiers featured among Collectible Minifigures. 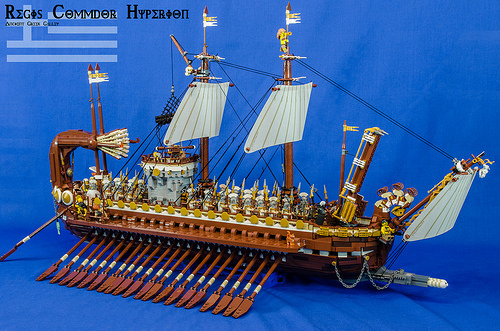 Rat Dude has built a beautiful forty-oared Greek galley named the Hyperion. While this armchair archaeologist might quibble with the double masts (for a such a small ship), the overall effect from stem to stern is gorgeous. I particularly love what appears to be rams’ heads on the bow, along with the metal ram. The Greek marines on deck look ready to board an enemy vessel!